In their first debate, Democrat Jennifer Wexton launched a series of attacks on incumbent Republican Rep. Barbara Comstock, who also hit back in a debate Friday morning that felt heavily scripted at times. LANSDOWNE, Va. — Democrat Jennifer Wexton launched a series of attacks on incumbent Republican Rep. Barbara Comstock, who also hit back in a debate Friday morning that felt heavily scripted at times. The 10th Congressional District stretches from the West Virginia line through Loudoun County into McLean along the Potomac River, and is seen as a key race for Democrats if they hope to make significant gains in the House. “This election is about results versus the resistance,” Comstock said. President Trump is one of the issues Wexton raised. “We live in a troubling time for our country. We have an administration in Washington that is constantly assaulting many of the values that Americans hold dear,” Wexton said. “They’re mortgaging our children’s and our grandchildren’s futures by permanently raising the deficit,” Wexton said. 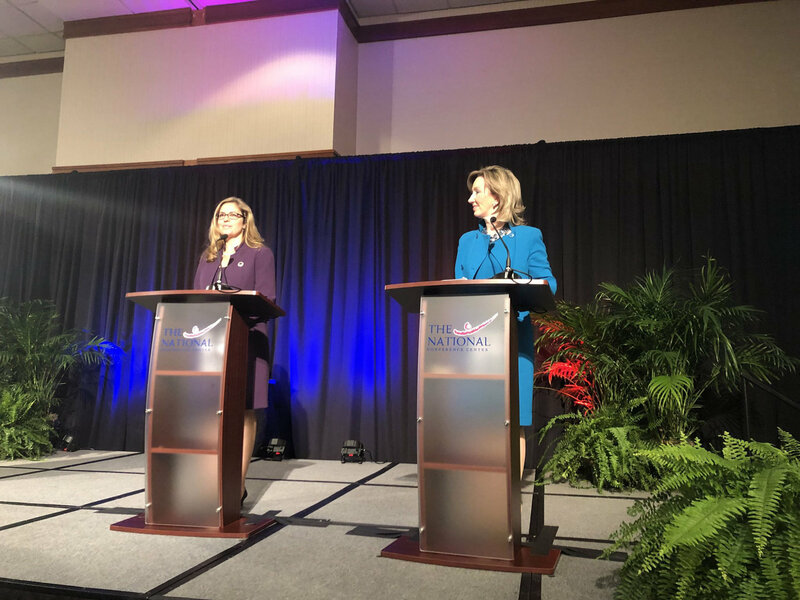 For her part at the debate, sponsored by business groups including the Loudoun Chamber, Comstock charged that Wexton is too liberal, and the focus of the race should be on the economy. She also promised a push to cut regulations, which Wexton challenged as not always a good thing. “Saying ‘get out of the way’ is a half-baked response. It’s the government’s job to regulate externalities and protect its citizens,” Wexton said. “I will continue to work with the business community,” Comstock said. “There’s been Republican control of Congress for years, and they’ve sat on their hands and put kids in cages,” Wexton challenged. That drew boos and cheers from supporters each candidate had brought to the ticketed event, and a request for “order please” from the moderator. “In Congress, I’ll work for true comprehensive immigration reform,” Wexton promised. Each candidate emphasized the importance of Dulles Airport to the district’s economy. Comstock noted the regular fights in Congress to prevent longer flights from Reagan National since members of Congress and many others often prefer to fly from Reagan National when possible due to the convenience. Comstock also highlighted her ongoing support for the Metro funding promised by the federal government after the deadly 2009 Fort Totten crash. Comstock has introduced Metro funding and reform bills, including one this week, but they have yet to advance. She is currently the only Republican representing a district with a Metro station. Wexton voted for Virginia’s funding plan for Metro this year, and she challenged Comstock’s praise of transportation improvements funded in part by a 2013 state transportation bill that Comstock actually opposed. Outside groups supporting Comstock are now attacking Wexton for praising that funding, which was approved before Wexton joined the General Assembly. Wexton promoted her vote this year to expand Medicaid in Virginia as permitted under the Affordable Care Act. Comstock backed off any push to repeal and replace Obamacare, instead suggesting a “piece-by-piece, change and reform” approach. “For the past 8 years my opponent and Republicans in Congress have been preaching a message of repeal and replace. Their actions show that they have no interest in solutions, only sabotage. Unlike them, when I go to Congress, I’ll work across the aisle to find real solutions,” Wexton said. Overall, Wexton claimed Comstock has changed positions on a number of issues over her time in office. “My opponent is a masterful political chameleon,” Wexton charged. “My record is one of getting results on your priorities … results, not resistance,” Comstock responded.